The euro finally rallied above our confirmation point. Price formed a relatively strong bullish candlestick bar on the daily chart, which strongly confirms that the correction is now complete. The new rally, if I’m correct, is still in a very early stage, so I’ll be cautious in my proposed targets until I can discern more of its internal structure. Synopsis: By moving above 1.1827, EUR/USD is expected to move upward to reach between 1.1837 and 1.1861, while it remains above 1.1712 and ideally above 1.1773. 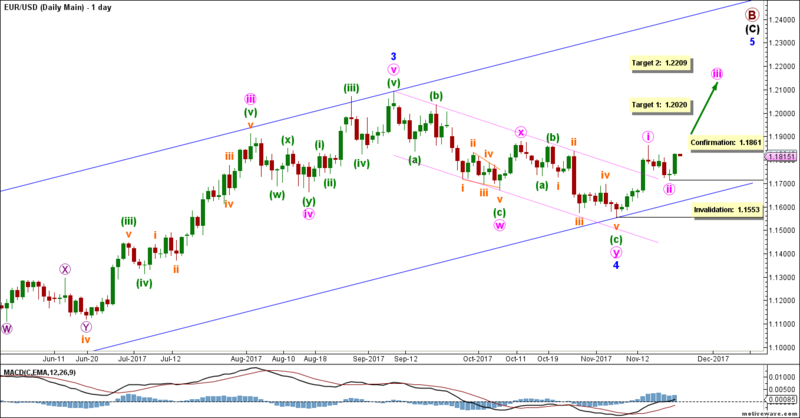 Elliott Wave chart analysis for the EURUSD for 22nd November, 2017. Please click on the charts below to enlarge. The bigger picture sees that the euro is moving sideways in maroon wave B, which is forming a flat labeled black waves (A), (B) and (C). Blue wave 4 formed a double zigzag labeled pink waves w, x and y. It retraced a bit less than 38.2% of blue wave 3. Blue wave 5 is forming either an impulse or an ending diagonal labeled pink waves i through v.
Pink wave ii retraced nearly 50% of pink wave i. It’s very likely complete. 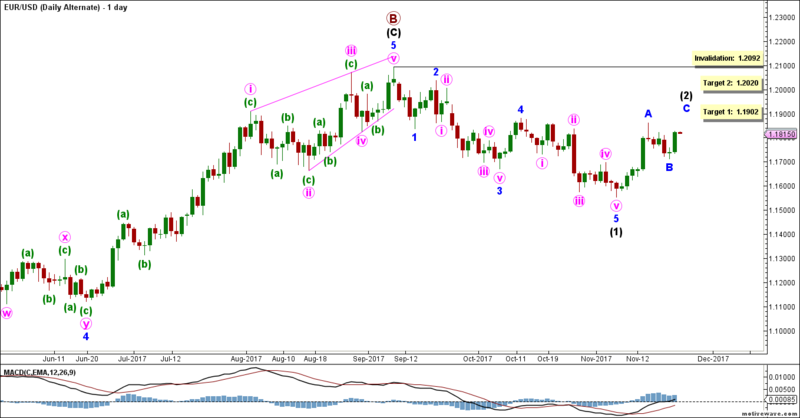 This count expects the euro to continue moving toward the upside in pink wave iii. This will be confirmed by movement above 1.1861. At 1.2020 pink wave iii would reach 100% the length of pink wave i, then at 1.2209 it would reach 161.8% of its length. This wave count is invalidated by movement below 1.1553 as pink wave ii may not move beyond the start of pink wave i. This main hourly count sees that pink wave iii is forming an impulse labeled green waves (i) through (v). Green wave (i) is likely forming an impulse labeled orange waves i through v.
Orange wave iii is forming an extension labeled violet waves 1 through 5. Violet waves 1, 2 and 3 are likely complete. Violet wave 4 will probably find support between 1.1805 and 1.1792. 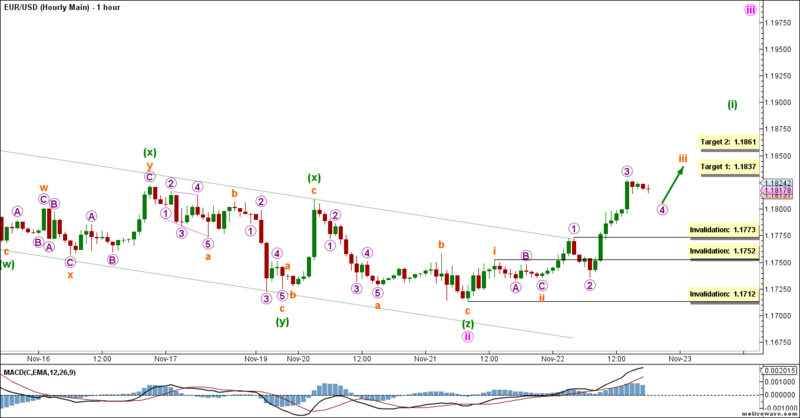 This count expects the euro soon to resume moving toward the upside in violet wave 5 to complete orange wave iii. This will be somewhat confirmed by movement above 1.1827. At 1.1837 orange wave iii would reach 261.8% the length of orange wave i, then at 1.1861 it would reach the most recent significant high of pink wave i. This wave count is invalidated by movement below 1.1773 as as violet wave 4 of this impulse may not enter the price territory of violet wave 1. If it invalidates this low-level structure, it will then be invalidated by movement below 1.1752 as orange wave iv may not enter the price territory of orange wave i. If it invalidates even this medium-level structure, it will be finally invalidated by movement below 1.1712 as green wave (ii) may not move beyond the start of green wave (i). This alternate daily count sees that maroon wave B is complete and that maroon wave C is now unfolding toward the downside. Maroon wave C is forming an impulse labeled black waves (1) through (5). Black wave (1) formed an impulse labeled blue waves 1 through 5. Blue wave B retraced nearly 50% of blue wave A. It’s very likely complete. This count expects the euro to move toward the upside in blue wave C to complete black wave (2). This will be confirmed by movement above 1.1861. At 1.1902 blue wave C would reach 61.8% the length of blue wave A, then at 1.2020 it would retrace 100% of its length. This wave count is invalidated by movement above 1.2092 as black wave (2) may not move beyond the start of black wave (1).